London (AFP) - Juan Martin del Potro claimed Wednesday that Wimbledon conqueror Rafael Nadal has more weapons at his disposal than any other player after losing a five-set Wimbledon quarter-final epic. World number one Nadal saw off Del Potro 7-5, 6-7 (7/9), 4-6, 6-4, 6-4 after four hours and 48 minutes on Centre Court to reach his sixth Wimbledon semi-final and 28th at the majors. For Del Potro, who dived, tumbled and slipped as he tried to contain the two-time Wimbledon champion it was an 11th defeat in 16 meetings with the Spaniard. It also followed a semi-final defeat to Nadal at the French Open last month where he won just seven games. "Rafa is a fighter and he has a fantastic game. He deserves to win today and keep winning," said the 29-year-old Argentine. "I'm glad to play in this level against the No. 1 in the world. "I was close to beating him and I couldn't because Rafa always has a little bit more than the rest of the players on tour." Nadal, in the quarter-finals for the first time since finishing runner-up to Novak Djokovic in 2011, carved out the crucial break in the opening set for a 6-5 lead and claimed the opener off a Del Potro backhand error. The world number one then wasted four set points in the second. One of those was on a double fault in the tiebreak and the giant Argentine pounced to level the tie. Former US Open champion Del Potro then stunned the Spaniard with the only break of the third set in the 10th game, secured with a deep forehand. But back came Nadal to level before an enthralling final set which was punctuated by great shot-making and spectacular dives and falls by both players. Nadal broke for 3-2 but had to save break points in the sixth and eighth games before securing a memorable victory. A weary Del Potro, a semi-finalist in 2013, finished with 33 aces and 77 winners but even those impressive statistics were not enough. "Well, at the moment I'm feeling sad after almost five hours of running and playing this high level against the No. 1 in the world and losing," added Del Potro. "It's not good for me. But maybe tomorrow or after tomorrow when I get home and I watch the match or some points again, I will be glad with my level, with my style of game." Nadal, the 2008 and 2010 champion, will now face three-time winner Djokovic for the 52nd time with the Serb holding a 26-25 edge. With Roger Federer knocked out by Kevin Anderson, who faces John Isner in the other semi-final, both Nadal and Djokovic have an ideal opportunity to add to their Slam collections. Nadal has 17 while Djokovic has stalled on 12 since completing the career Grand Slam at Roland Garros in 2016. "Sorry to Juan Martin, he's an amazing opponent and player. 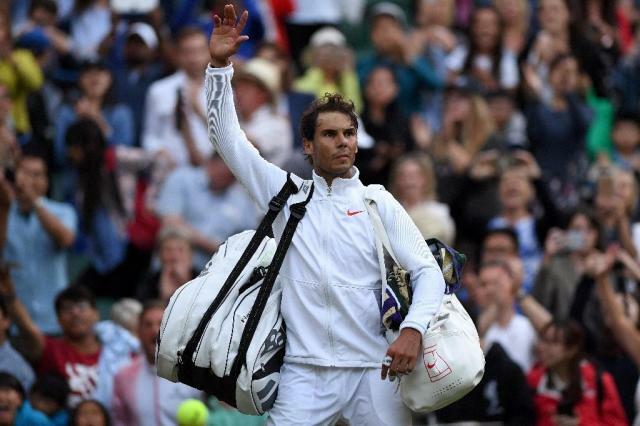 In some ways he deserves to win as well," said Nadal after the breath-taking quarter-final. "Anything could have happened, so this is a big achievement for me to get to the semi-finals at Wimbledon. "In the last set there was a little of everything, great points, great rallies, he was hitting crazy with his forehands. I tried to resist and maintain focus." As Nadal looks ahead to the semi-finals, Del Potro heads for his next tournament. "I play Los Cabos in Mexico -- the beach," he smiled.